You can play this game, inside the house or outside. It can be part of your carnival day games. 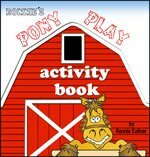 Using small bean bags or sponge balls, stand at leaste one foot away from the pony and aim the ball into the pony's mouth. into the pony's mouth is the winner.